Who would have thunk it? My top pick of the week is Avengers #28, written by Brian Michael Bendis! This book stood out because it took on a more literary style of storytelling. The first couple of pages had the artwork to one side and the text on the other side of the page. It kept to this layout, but further on, there was also use of dialogue balloons. This technique works well when you want to play up certain emotional cues. 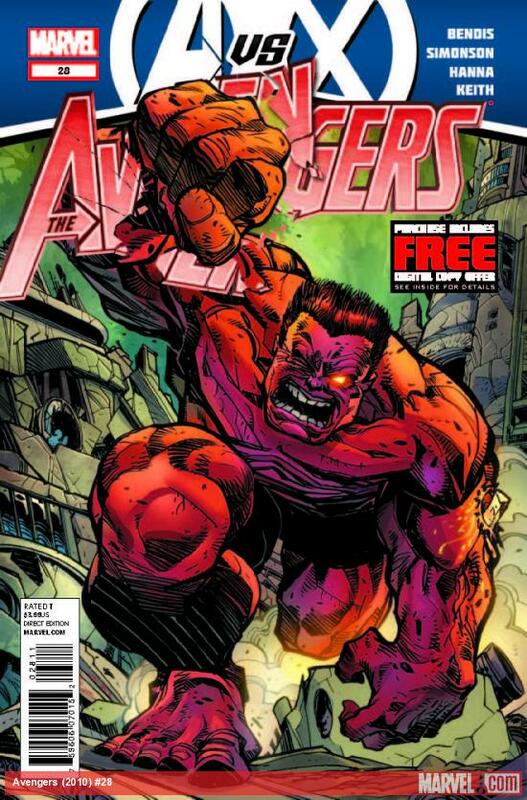 The story is told through the perspective of the Red Hulk or as we like to call him, Rulk. He's a sympathetic character in this issue. He talks about how no one else on the Avengers seems to understand who he is behind the big red skin and the military experience he has. Everyone just sees... a Hulk, and so no one would stand behind him without Captain America saying so. With the layout and the absence of a lot of dialogue, we get a sense of the awkwardness of the characters' relationships without the story feeling awkward, itself. Rulk takes it upon himself to infiltrate and try to take down the leader of the Phoenix Force/Rangers: Scott Summers. It would prove his worth to his team members. He doesn't go in blind or without a plan. He knows not to take any weapon that has any trace of metal because Magneto would find and kill him in an instant. He knows to attack Cyclops if only Emma Frost is nowhere near because she could sense him out and read his mind and discover his plot. This is a huge undertaking and it would be a big blow to the Rangers if he can get his plan to work. Unfortunately, it doesn't work out for him and he is discovered. Walter Simonson and Scott Hanna (on inks) create fantastic artwork. There's lots of action and emotion in the lines. I think it was nice to focus on a single character for an issue. I was getting a little tired of those constant team attacks. It'll be interesting to see what will stop the Phoenix Force in the end. Strategies don't seem to ever work out, solo attacks don't work, team attacks don't work, and I think it'll still come down to the fate of Hope Summers.